The Dakine designers know it's impossible to have a good snow day if you can't feel your fingers, so stay safe and extend your time in the mountains with the Dakine Excursion Gloves. A durable, water-repellent leather palm and shell with a DWR finish hides the real bread-winner: a GORE-TEX® waterproof/breathable insert that keeps water out but still lets your hands breathe. 4 Way Stretch Soft Shell w/ DWR Finish – For additional comfort, 4-way stretch fibers are incorporated into this fabric. The surface of the shell is treated with a Durable Water Repellent (DWR) finish and coated on the backside for additional water repellency. GORE-TEX® Waterproof / Breathable + Gore Active – Gloves engineered with GORE-TEX® inserts + Gore Active technology are durably waterproof, windproof and breathable -- guaranteed. The whole system of inner lining, membrane and outer material is optimized for extreme breathability. This increases the level of comfort even in a wider range of activity levels. 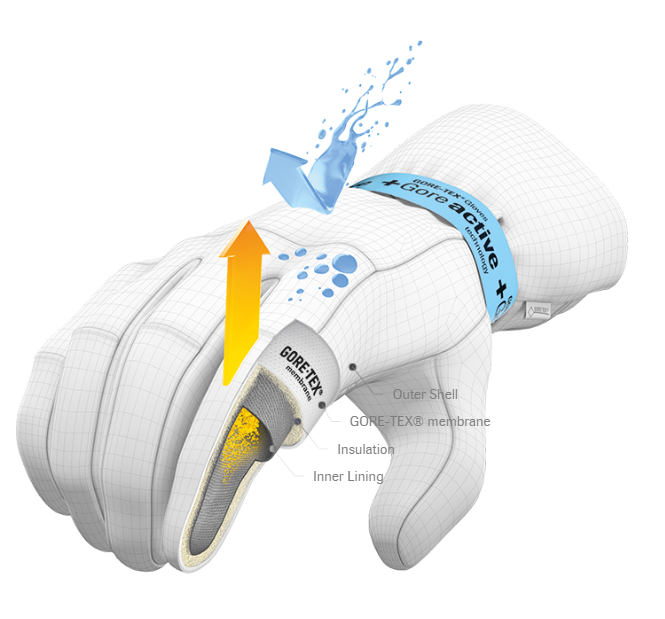 PrimaLoft® [170 g] – PrimaLoft® insulation offers superior performance for high quality cold-weather gloves. PrimaLoft® is lightweight, breathable and is proven to repel water better than any other synthetic or natural insulation, so you remain dry, warm and comfortable even under the most extreme conditions. Fixed 360 g Wool Lining – The natural properties of wool provide for superior warmth and moisture management. Non-abrasive, this wool has an extremely soft hand. Warmth Index: 5 – Gloves and mitts are rated from 1 - 5 based on the amount of insulation and lining materials. Styles with a warmth rating of 1 are designed for warmer weather conditions or riders who require less insulation. At the other end of the spectrum, gloves or mitts with a rating of 5 are the warmest styles for the harshest conditions, and for those who need maximum warmth.